Chelsea coach Maurizio Sarri says N'Golo Kante is not being utilised in his favoured defensive midfield position as he does not move the ball quick enough. One of Sarri's first decisions as boss was to bring deep-lying playmaker Jorginho with him to Stamford Bridge from Napoli, beating Manchester City to the sought-after Italy international. Initially it looked a fine fit, as both Chelsea and Jorginho began the season well, but teams soon started to put pressure on the Brazil-born midfielder and that has had a knock-on effect on how Sarri wants his team to play. 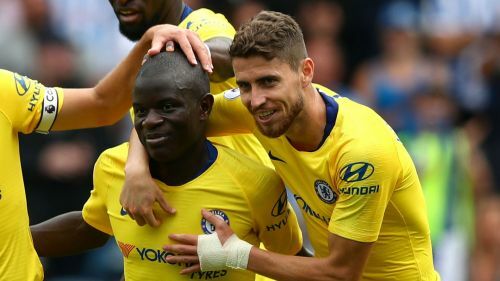 Jorginho's arrival meant Kante – previously a key player in defensive midfield for title-winning Leicester City and Chelsea teams – was shifted further forward. Sarri has refused to yield to fan pressure and play Kante deeper, explaining that the France international does not suit his preferred needs for the role. When reminded Kante won two Premier League titles and a World Cup with France playing holding midfield, Sarri said: "But in a different system. It depends on how you see football. "In that position, I want to play someone able to move the ball very fast and this is not the best characteristic of N'Golo. "N'Golo is very useful for us, but this is not his best characteristic." Sarri was speaking ahead of Thursday's Europa League last-32 second leg against Malmo, for which Pedro, Davide Zappacosta (both ill) and Kepa Arrizabalaga (hamstring) are all doubts. Chelsea are 2-1 up from the away leg.